What: Late last year, ShopAdvisor teamed up with major fashion publisher, ELLE Magazine, for an innovative drive-to-store program utilizing beacons and geo-fences to connect consumers to participating brands. 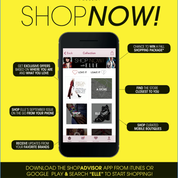 Partnering with Barnes & Noble, Vince Camuto, Guess and Levi’s, the ShopNow! campaign delivered results 100x better than industry standards. Learn how you can do the same. ShopAdvisor, Inc. bridges the gap between web commerce, proximity, and retail. ShopAdvisor’s mobile proximity platform, data sciences and easy to use app deliver a personal shopping concierge for consumers that advises on when, where, and what to shop. Shoppers can save items they love and be alerted when the time to buy is right, saving time and money. ShopAdvisor works with more than 30 media publishers, including Cosmopolitan, People StyleWatch, Marie Claire, Men's Health, Cooking Light, Real Simple, and many more to allow shoppers to shop directly from the publishers' omni-channel content. Consumers can download the free ShopAdvisor mobile app for their iOS or Android device, or go to ShopAdvisor.com.